I can't replicate it. Nor can NFITC1. It just happens.... text missing letters and stuff. It always happens eventually (we think on saving rather than opening). But NFITC1 is working on all-new tool. Work has finally commenced on a few of the other mods now that the DLL and the Audio Replacement mod are virtually done. Wouldn't be just for me, but ok. I didn't know about the editor so I'll check it out. Thanks! Well, it would just be for you really. Because that's a specific list of things that others won't agree with, and causes me a lot of work, which is why I stopped adding so many options (I used to have 2 menu types, break 9999 limit options... you name it!) and cut down everything to a bare minimum. It is impossible to please everyone or add options for everything... and I'm not being paid either. Big fat cat companies like Square Enix wouldn't do even half of what I have despite being paid large sums. Still, with the tools around, you should be ok. I'm having fun. I've fixed the bug with the support in Junon so the Dolphin can't find the spot for you. And if Weapon is enabled (level 2+)... well, it's much harder. Only 2 new spots will work as opposed to many... and the electric support will kill you. Instantly. No ifs, no buts. Game over, sucker. Does it actually do anything in the vanilla game if you do go near the tower? Yeah it puts you back on the other map, where you have miraculously survived. Nah. The field engine wouldn't support it with normal opcodes... and i think whole idea is story-line takes precedence. Actually, I should have expanded on each of these so that I don't look like a mindless bigot (although, I am going to come across as a total apricothole), but most of these are in the Reunion Database or have been explained time and again, and I have a policy of simply not replying to posts asking for items we've discussed 100x to be changed, ad nauseam. But let's break that rule and run through these. It was broke. So, I fixed it. If you look at the very first post, you will find The Reunion Database, which lists every single non dialogue change. We did not change things blindly. There's a point where you have to consider if a change actually has a purpose and is helpful/desirable. The changes are made where the original translation was incorrect or too far removed from what the Japanese was getting at. It has absolutely nothing to do with "helpful" - and "desirable" is very subjective. What is desirable to this project is translating and localizing based on the facts and on what the writers wanted... not keeping things simply because people are used to it. Or because canon dictates it. This is made clear on the translation post at the beginning, which you should have read. Changes like "Mystile" to "Mystere" and "Chocobuckle" to "Chocobokkuru" are an un-translation/localization; why? Because they are correct. See The Reunion Database. You can't "undo" a translation or a localization. The first post and the Help file both point to The Reunion Database. I also had to use menu option "Form" to realize it was "Order"; what the option does isn't what "form" means, where "order" is clear and fits perfectly, so I don't understand why that's the word you used much less why it was changed at all. Names are now totally consistent across all menus. Either word works. It's not breaking your back to learn about 3 drop down menus. Come on. Then why are you adamant I should change it? Why are you bringing this up when you said in your post that you wanted to discuss this with an argument of reason? How can you have a reasoned argument when you don't know if it's closer than "Pandora's Box"? And why should I listen to you that being the case? but I wouldn't have used it for a spell name over "Pandora's Box". And, thus, would have completely failed at localizing the game accurately. Instead, you'd just keep a name that means NOTHING close to the original and was pulled out of thin air. That is not professional. It's not what this project is about. It's not in most cases. The original name is "Diving" from "Scuba Diving [equipment]". There is no reason I couldn't change it. The Japanese is literally "Aqua Breath" アクアブレス [Akua buresu]. I've actually come across the idea of swapping names around before and I don't believe it's something game devs would do without significant reason. And you worked out I didn't have a significant reason... how? On the basis of me seeming to change things willynilly? A. Alt + F4 will close the game. So the Quit menu is redundant anyway. B. I have added "hold select + start" to close game too. If you hold those two for a few seconds, the game will close from ANYWHERE. C. The quit menu does not exist in PSX version, and indeed makes the menu look overly long and ugly. I'd love to discuss more and I hope you'll consider these things. Items in white, blue, or orange are not up for discussion. This isn't me being Adolf Hitler. This is me ending 100 more posts like yours - because I've been through this gauntlet so many times it's unreal. And we've gone over these things again and again and again. The project is near finalized. fern me it must be frustrating having to justify yourself over and over about the mod you've put countless hours into for free. Keep up the good work mate, I can't wait to get my hands on R06! Thanks! And it is. And I do try to be diplomatic - but I'm simply not cut out for it. And my strength is telling it as it is. Not good for PR. But it gets harder when it's the exact same questions about non dialogue over and over. And when the help file AND first post both point to an insanely long database that was largely constructed to STOP those questions. People come in and they start with "Love your mod...." and it turns to "But I want A B C D E F G changing, because I don't like the change." The above person was pleasant enough, but they said they'd discuss their problems with reason - then proceeded to show they hadn't read the database or help file or any of this thread - and had just dreamt up that we change things because we like to. When that's totally not the case. I mean, the example of Aqua Breath is a total face palm. I know I'm coming across harsh and direct... but that's who I am - and those kinds of "feedback" from people do not make me any more diplomatic or "nice". hahaha! And I also got blamed for their save menu loading longer. I think you are more patient than I am anyway. I could not really reply for the nth time to the same questions over and over. This is nitpicking of course. Reunion is a labor of love and a gift we all are extremely thankful for, Dan! I am looking forward to see R06 out and to celebrate its release! Yes, but I've also added Sel + Start being held to also close the game down. There really is no reason to have a quit option you have to navigate to - and couldn't access in minigames or most other places anyway. Surely no-one wants the quit menu when they can hold Sel + Start? It does not compute, Navigator. Is there a way to install the mods for other language versions of the game? I want to use the 60fps battle mod but when i try to install it says my exe isnt compatible so it only works on the English version of the game. I just stopped responding to most of them. The big thing for me was how many hours, days, weeks and months I've spent to try and create an easier process for everyone. That largely included all the Q&A and FAQ I created after releases. But it went largely ignored by new users who come to the forums looking for personal help on matters that are already posted countless times. Not true for everyone of course, but unfortunately I've grown so tired that they get lumped into one group that I just ignore. Looked it up and the 60 fps mod has its own topic (sorry) "[FF7PC-98/Steam] New Frame Limiters + 60FPS Battles (L02)" but the download file linked there is 404 not found. Can i get that specific mod somewhere else besides the Reunion Patch that doesnt work with other non english versions of the game? You answered your own question earlier. It isn't for non English exe. I doubt I will ever add support. The Reunion is compatible only with the English 1998 version and English Steam version (as of R04) of Final Fantasy VII. DLPB's entire existence is the most Aspergers thing I've ever heard of, the rabbit hole gets deeper with every bit of information. More hatred, and it even comes with a comma splice. I assure you, I do not have Asperger's or autism (in response to the little prick at the bottom) I do have a slight obsession with getting this game fixed, but that's because I have come too far to fail—and I enjoy learning things. I've gained a much better understanding of English (which Covarr has largely been responsible for), localizing, programming (including x86 asm), and modding games in general. "What do I have to be sorrowful about?" But on point: These ridiculous 'people' [not all of them, to be fair] are STILL banging on about that Cait strawberries mod, which I officially abandoned over a year ago (maybe 2? 3?). It seems that any and all change is blasphemy to some of these guys, and they accuse ME of having mental issues haha. You couldn't make it up. I abandoned the Cait strawberries mod because I have better things to do than to sort out of all problems in the game. I think people here are far happier that my time is being devoted to more important things, such as the localization, bug fixes, script fixes, and the broken audio module. Even DLPB (the OP and author of the retranslation) admits in the post he has zero knowledge of Japanese, so likewise he wouldn't know the inaccuracies he's so mad about from dog strawberries. No. Just no. When you have two very competent Japanese speakers in constant conversation with you (one of whom has provided a full translation), and you have invested hours into studying the game, you actually do know enough to localize the game. The idea I don't know about the inaccuracies is the only thing 'dog strawberries' around here. Also, I do have a decent working knowledge of Katakana, so 'zero knowledge of Japanese' is 'dog strawberries' as well, like this dude's entire sentence. Further, I am not 'mad' about the inaccuracies. 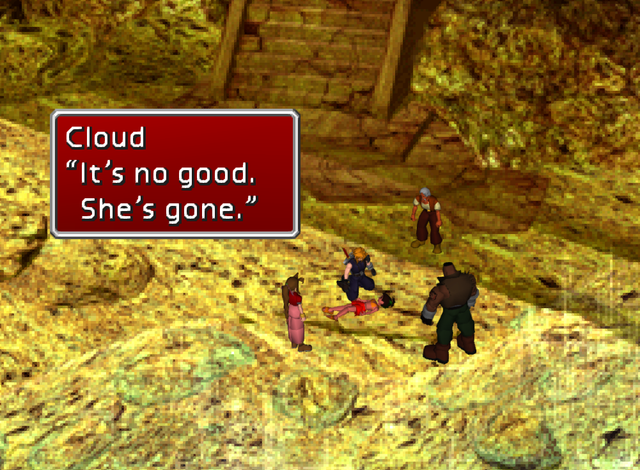 I don't go to bed at night weeping for FF7 flaws. I also want to clear this up. The only reason this project 'took 5 years' is because of the huge gaps in activity, largely due to the fact only 2 people have been willing to invest their time to help with the Japanese dialogue (Luksy and Shikun), and they have lives of their own. Luksy only arrived on the scene about two years after I started to modify the non-dialogue with the help of Defade. Shikun (Japanese proof check) has only been here for around 6 months. The only thing I was disappointed in with the interview for Eurogamer is that the interviewer latched onto a comment I made about when the project started and sensationalized it. But that's just how journalism works. His title was click-bait and worked, but has kind of made us all look rather incompetent. He supposedly has a native speaker on board. But if he's the same sperglord that wanted to wipe an entire character from the game, why trust his judgement in other things like picking a competent translator? Yeah, I had a long list of Japanese speakers forcing their way towards me. Couldn't keep 'em all back! I fought. I tried. Oh, how I tried! ‘Please,’ I said. ‘I can only take one of you!’ It was Luksy. Luckily, even though the reality is that only Luksy actually did what he said he would do, he's also massively competent with the Japanese language. He likes to keep his private life private, so I leave it at that. Some of you probably wonder why I carry on doing this with so much intolerance and hatred around. Well, aside from the comments I have just made, it's because these guys are in a minority. As I have frequently stated: The people who whine the most are the ones who help the least—or, as Plato said: The emptiest vessels make the loudest sound. I am sorry to read all the bashing you personally had and have to go through at this present day as well. And I am sorry to see that the main focus of Reunion, which is its iconic new localization, is bashed as well without cause. Because the hatred comes from people that did not even bother to see what this is all about. All the effort, hours and yes, love... put into this project. Even if people may not agree with each dialogue or word change, it is unfair to belittle and drag into the mud a project that has highest merits. Focusing only on one now abandoned part of the project (Cait Sith ) means to have a very narrow view. These people are not even aware of the importance of many fixes, not only dialogue related, made by the author. If they bothered reading about the accomplishments made in these five years of devoted dedication I am sure some of them would feel a bit ashamed of what they wrote. Carry on, Dan. I still believe that the vast majority of people are very grateful for all you have done and are still doing for the community. I suppose it should also be noted that a ton of the FF7 wiki is based on research Luksy and I were largely responsible for... Not that we got any thanks for it. Also, it's even more laughable, because they STILL think that the Cait mod was mandatory. This is like the 5th time I have seen "Haha, what a dope. He wants accurate translation, but then removes an entire character! hahaha" It shows you just how little they actually know or want to know. Somebody there also asks why Cait can't just be removed entirely. That's a fair point, and I'll even consider it. It would become the Cait Removal mod I'd call it "The Late Cait" Let's see how many people I can trigger. And thank you. It's nice that you signed up to be nice, too. Don't worry - I know that this project is appreciated by the majority. R06 will be out by December, I am fairly sure. I did think a week or two, a week or two back, but it's a monster of an update. I've opened up the Japanese proof checking document (that Charlie Beer/Shikun is using) for view.